Small class sizes and top notch instructors make this mini-camp a great opportunity to hone your game. Children and adults are welcome. Players will be divided into groups of similar strength to maximize the learning experience. Each group will have sessions with several different instructors. This format allows the instructors to tune each session to the strengths and needs of the students. It’s almost like one on one instruction from some of the top names in chess. The 2019 faculty has yet to be finalized. 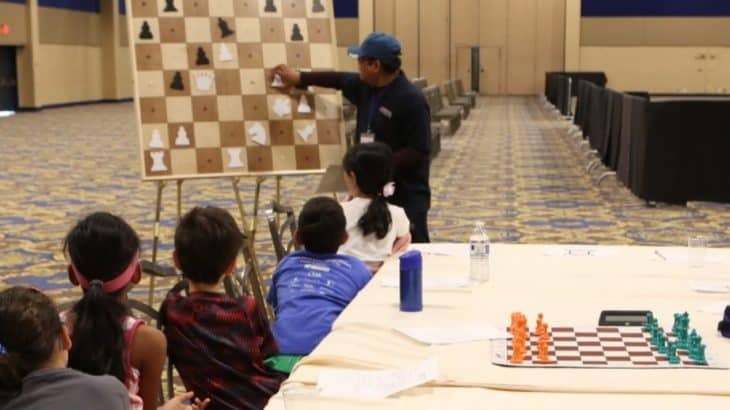 Past instructors have included WGM Angelina Belakovskaia, GM Pavel Blatny, GM Walter Browne, GM Fidel Corales, GM Ben Finegold, WGM Sabina Foisor, GM Timur Gareyev, GM Dmitry Gurevich, GM Ron Henley, GM Melik Khachiyan, GM Atanas Kolev, GM Sergey Kudrin, GM Elshan Moradiabadi, GM Tigran Petrosyan, GM Enrico Sevillano, and WGM Jennifer Shahade. I liked the small groups with instructors of differing backgrounds. One instructor’s idea of having students play a game and taking turns commenting on the moves was very instructive. I learned more than I thought I would. I liked almost everything: it was exciting and fun to learn. Thank you to all the coaches. Great stuff, great teachers, nice campers, very fun. Thanks! The Chess Event of the Year! Can You register for event if your not playing in tournament? Yes. Anyone can participate in the Chess Camp.